How to Cite This Chapter: Rodríguez-Gutiérrez R, Brito JP, Zgliczyński W, Płaczkiewicz-Jankowska E. Hypopituitarism. McMaster Textbook of Internal Medicine. Kraków: Medycyna Praktyczna. https://empendium.com/mcmtextbook/chapter/B31.II.8.3 Accessed April 23, 2019. Molitch ME, Clemmons DR, Malozowski S, Merriam GR, Vance ML; Endocrine Society. Evaluation and treatment of adult growth hormone deficiency: an Endocrine Society clinical practice guideline. J Clin Endocrinol Metab. 2011 Jun;96(6):1587-609. doi: 10.1210/jc.2011-0179. PubMed PMID: 21602453. Hypopituitarism refers to a syndrome caused by deficiency of one or more pituitary hormones, which can result from pituitary or hypothalamic disease (deficiency of pituitary hormone–releasing hormones). Deficiency of all pituitary hormones is known as panhypopituitarism. 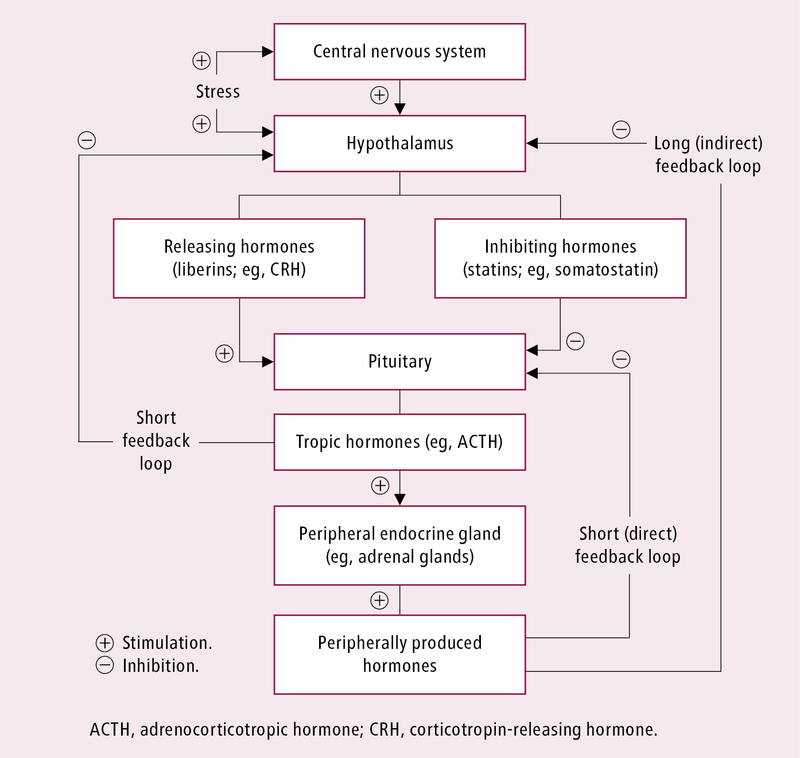 The resulting changes in hormonal levels and in the choice of diagnostic tests are related to the presence of several short and long feedback loops among different parts of the hypothalamic-pituitary-peripheral gland system (Figure 1). 1) Congenital: Familial hypopituitarism with multiple hormone deficiencies (PROP1, HESX1, PIT1) or developmental abnormalities (pituitary hypoplasia or aplasia). 2) Tumors: Pituitary tumors (functioning and nonfunctioning pituitary adenomas, Rathke or arachnoid cysts), posterior pituitary tumors (ganglioneuroma, astrocytoma), hypothalamic tumors (astrocytoma, germinoma), craniopharyngioma, tumors of the optic chiasm (meningioma, glioma), and metastases (most frequently breast and lung cancer). 3) Cranial trauma and iatrogenic: Severe head trauma, surgery (most frequently transsphenoidal), and pituitary/sellar irradiation. 4) Vascular: Postpartum pituitary infarction (due to postpartum hemorrhage [Sheehan syndrome]), pituitary apoplexy (sudden hemorrhage into the pituitary gland), internal carotid artery aneurysm (compression), and stroke (ischemic or subarachnoid hemorrhage). 5) Inflammatory and infiltrative lesions: Sarcoidosis, hemochromatosis, Langerhans cell histiocytosis, granulomatosis with polyangiitis, lymphocytic (autoimmune) hypophysitis. 6) Infectious: Tuberculosis, syphilis, mycoses, pituitary abscess, encephalitis, or meningitis. 7) Isolated hormone deficiencies: Growth hormone (GH) or gonadotropin deficiency (Kallmann syndrome: defective gonadotropin-releasing hormone synthesis [causing hypogonadotropic hypogonadism] associated with hyposmia). Isolated deficiency of adrenocorticotropic hormone (ACTH), thyroid-stimulating hormone (TSH), or prolactin is very rare. In general, the acquired loss of pituitary function follows the sequence: GH, luteinizing hormone (LH)/follicle-stimulating hormone (FSH), TSH, ACTH, and prolactin. Clinical manifestations can present suddenly or gradually, can be mild or severe, and can affect one, several, or all of the pituitary hormones. Consequently, the clinical presentation varies depending on the age of onset, severity of the hormonal deficiency, velocity (chronic or acute) at which the disease affects the pituitary gland, and number of cell lines affected (Table 1). Additional specific situations are described below. In patients with pituitary apoplexy (sudden hemorrhage into the pituitary gland), the presentation depends on the severity of hemorrhage and may include sudden-onset headache, nausea, vomiting, and confusion, which result from elevated intracranial pressure; visual disturbances resulting from compression of the optic chiasm and oculomotor nerves; and paralysis of extraocular muscles caused by a hemorrhage to the cavernous sinus. The most serious signs and symptoms of acute hypopituitarism are due to ACTH deficiency, which can result in life-threatening hypotension (refractory shock) and severe neurologic signs and symptoms in the case of a subarachnoid or intraventricular hemorrhage. On the other hand, hemorrhagic apoplexy of a pituitary adenoma may result in spontaneous healing and subsequent resolution of symptoms of hormone hypersecretion. Acute ACTH deficiency may occur when the pituitary gland is damaged in the course of pituitary apoplexy, stroke, head trauma, or neurosurgical procedures. It is a life-threatening condition (adrenal crisis: Acute Adrenal Insufficiency). Chronic ACTH deficiency (Secondary Adrenal Insufficiency) may become symptomatic and potentially lead to adrenal crisis after a sudden increase in the glucocorticoid requirements, especially in the setting of acute stress or infection. Signs and symptoms of posttraumatic hypopituitarism usually develop gradually, becoming clinically overt within ~1 year after the event. In ~30% of patients, severe head trauma may also cause damage to the hypothalamic supraoptic nucleus or the posterior pituitary lobe, resulting in antidiuretic hormone deficiency and the development of central diabetes insipidus. Diagnosis entails a clinical examination looking for clinical manifestations of hormone deficiency (Table 1) and requires the documentation of subnormal secretion of pituitary hormones in basal and/or stimulated tests exploring stimulation and feedback loops in the endocrine system (Figure 1). Each pituitary hormone must be tested separately. 1) Basal cortisol (8:00) levels. 2) TSH and free thyroxin levels. 3) Men: LH and basal testosterone (8:00). Women: In patients with normal menses, no tests are needed; if menses are abnormal, measure levels of FSH, LH, and estradiol. 4) Insulinlike growth factor 1 (IGF-1) (also called somatomedin C; its production is stimulated by GH). 2. Magnetic resonance imaging (MRI) of the parasellar region should be performed in every case of hypopituitarism to determine its cause. 3. Visual fields should be assessed in patients with suspected pathologic lesions in the area of the optic chiasm. a) ≤3 mg/dL (82.7 nmol/L): Repeat the test. If the results are consistent, this is a strong evidence of adrenal insufficiency (of any cause). b) 3 to 18 mg/dL (83.7-496.6 nmol/L): This is an indication for evaluating the ACTH reserve (see below). c) ≥18 mg/dL (496.6 nmol/L): ACTH secretion is sufficient. a) Measure ACTH only if the cortisol level is ≤3 mg/dL. Low or normal ACTH values in this setting are consistent with central (pituitary/secondary or hypothalamic/tertiary) adrenal insufficiency. The corticotropin-releasing hormone stimulation test may be used to discriminate between pituitary and hypothalamic localizations of central adrenal insufficiency. b) ACTH reserve (applying physiological stimuli to enhance ACTH secretion): The gold standard is the insulin-induced hypoglycemia test (careful monitoring and physician attendance required). The test used most frequently is the metyrapone stimulation test. 2. Thyroid function—TSH and free thyroxine: Low free thyroxine levels with TSH in the normal range are most frequent seen. Low or slightly elevated TSH levels (usually <10 mIU/L) are consistent with central hypothyroidism (in other words, with a clear decrease in thyroid hormones one expects a marked elevation in TSH, usually >20 mIU/L). 1) Men: Total testosterone measured at 8:00 and LH levels. A low testosterone level with a normal or low LH level is consistent with hypogonadotrophic hypogonadism. 2) Women: In patients with normal menses, no tests are needed. In patients with abnormal menses, measure the levels of FSH, LH, and estradiol. Low estradiol concentrations with normal or low FSH and LH levels are consistent with hypogonadotrophic hypogonadism. 1) IGF-1: A concentration lower than the age-specific lower limit of a normal range in a patient with pituitary disease confirms GH deficiency (IGF-1 production is stimulated by GH). 2) Provocative tests: Insulin-induced hypoglycemia or the arginine + growth hormone–releasing hormone stimulation test. Subnormal increases of GH ≤5 ng/mL are consistent with GH deficiency. 1) Patients with low prolactin concentrations usually have no manifestations. An exception are women in the postpartum period, who may not be able to nurse. 2) 20-100 ng/dL: Prolactin levels are usually elevated due to stalk compression or secondary hypothyroidism. If pituitary adenoma is the etiology, dilute prolactin to exclude the “hook effect” (spuriously low prolactin levels due a very high concentration of prolactin saturating the antibodies used in the prolactin assay). 3) ≥100 ng/dL: Consider the diagnosis of a prolactinoma. 6. Antidiuretic hormone deficiency: Consider testing (water restriction test [see Diabetes Insipidus]) if the patient’s history is consistent with diabetes insipidus. Differential diagnosis depends on the signs and symptoms and will vary, depending on the pituitary deficiencies, but may include primary adrenal insufficiency, primary hypothyroidism, or hypogonadism. Nevertheless, measurements of biochemical hormone levels, basal and/or stimulated, will confirm a definite diagnosis. Management of hormone deficiencies in secondary (pituitary) and tertiary (hypothalamic) insufficiency is similar and involves the administration of appropriate target hormones. 1. Secondary adrenocortical insufficiency: Hydrocortisone (see Secondary Adrenal Insufficiency). 2. Secondary hypothyroidism: L-thyroxin in individually adjusted doses (first correct the adrenocortical insufficiency). Increase the dose gradually, for instance, starting with 25 microg and titrating the dose up to 75-100 microg/d, based not on TSH levels but on the patient’s clinical condition and free thyroxin levels. a) Not interested in fertility: Testosterone (intramuscular testosterone enanthate 100 mg weekly or 200 mg every 2 weeks) or short-acting testosterone (topical gel 50 mg/d). b) Interested in fertility: Gonadotropins (LH and FSH) or gonadotropin-releasing hormone therapy. Note that testosterone replacement should not be given to patients with prostate cancer, uncontrolled heart failure, and erythrocytosis (hematocrit ≥54%).Evidence 1Strong recommendation (benefits clearly outweigh downsides; right action for all or almost all patients). Low Quality of Evidence (low confidence that we know true effects of the intervention). Quality of Evidence lowered due to risk of bias. Breast and prostate cancers are hormone-dependent cancers, and low-quality evidence (risk of bias) suggests that testosterone may cause tumor growth. The recommendation against testosterone replacement places a high value in avoiding a potential catastrophic adverse effect. Fowler JE Jr, Whitmore WF Jr. The response of metastatic adenocarcinoma of the prostate to exogenous testosterone. J Urol. 1981 Sep;126(3):372-5. PubMed PMID: 7277602. 2) Female patients (<50 years of age): Sequential low-dose estrogens combined with progesterone. In patients with no uterus, use low-dose estrogen replacement therapy without progestin. 4. Growth retardation in children: Recombinant human GH. The GH replacement therapy is also suggested in adults with severe GH deficiency.Evidence 2Weak recommendation (benefits likely outweigh downsides, but the balance is close or uncertain; an alternative course of action may be better for some patients). Moderate Quality of Evidence (moderate confidence that we know true effects of the intervention). Quality of Evidence lowered due to inconsistency among different outcomes measured, which suggests that therapy in adults with confirmed GH deficiency reduces their weight and body fat and increases lean body mass but can worsen peripheral edema and joint stiffness. This recommendation is also weak rather than strong due to the high cost and burden of treatment. Hazem A, Elamin MB, Bancos I, et al. Body composition and quality of life in adults treated with GH therapy: a systematic review and meta-analysis. Eur J Endocrinol. 2012 Jan;166(1):13-20. doi: 10.1530/EJE-11-0558. Review. 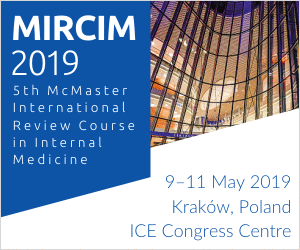 PubMed PMID: 21865409. 1) Surgical resection (transsphenoidal) is the treatment of choice for all pituitary adenomas (except for prolactinoma [see below]), tumors derived from Rathke pouch, and other parasellar tumors (except for germinomas). 2) Pharmacotherapy: Dopamine agonists for prolactinoma (cabergoline and bromocriptine). In TSH-secreting pituitary adenomas, long-acting somatostatin analogues are used to restore euthyroidism prior to the definitive treatment with transsphenoidal surgery. In the case of GH-secreting tumors, the routine use of pharmacotherapy (somatostatin analogues) as pretreatment before the neurosurgical resection is not recommended except in patients with pharyngeal thickness, sleep apnea, or high-output heart failure. 3) Radiotherapy is indicated for germinoma and should be considered for other unresectable tumors, either primary or recurring after radical neurosurgical treatment. Modern radiotherapy (stereotactic) approaches are associated with a lower risk of complications. 4) Chemotherapy is used in the case of metastatic tumors of the pituitary or as an adjuvant treatment in patients with central nervous system tumors sensitive to chemotherapy. 1) Intravenous glucocorticoids: Hydrocortisone 100 mg qid or dexamethasone ~4 mg bid at the early stages of pituitary apoplexy to correct the possible ACTH deficiency and reduce edema. 2) Surgical decompression: The decision to proceed to surgery usually should be made within 1 week from hemorrhagic apoplexy in patients whose neurologic status does not improve despite the administration of glucocorticoids. Adequate hormone replacement therapy allows maintaining a good overall clinical status. However, the mortality rates are higher compared to the general population, regardless of the cause of pituitary insufficiency. The prognosis is less favorable in patients with malignant central nervous system tumors causing pituitary insufficiency and depends on the type and stage of the tumor. ACTH, adrenocorticotropic hormone; FSH, follicle-stimulating hormone; GH, growth hormone; LH, luteinizing hormone; PRL, prolactin; TSH, thyroid-stimulating hormone. Figure 1. Stimulation and feedback loops in the endocrine system.